Acer palmatum. ©Jeff McMillian @ USDA-NRCS PLANTS Database (Accessed 5/2014). 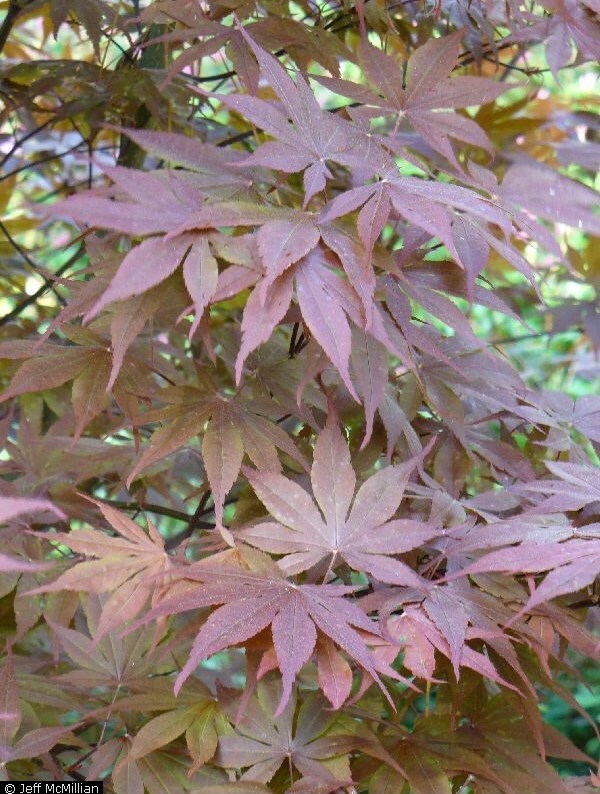 Acer palmatum is a small tree to about 6 m tall, often multi-stemmed, bark smooth, gray; twigs green-red. 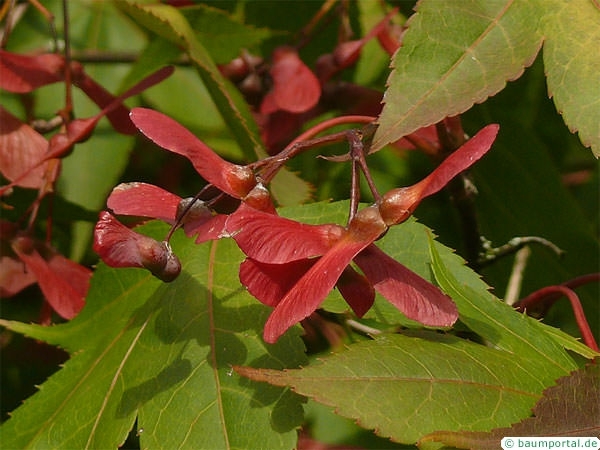 Leaves opposite, to 10 cm long, about as wide, green to red, deeply palmate 5-9 lobed and toothed, lobes long, narrow, tips pointed, smaller than leaves of other maple. Flowers red-purple, radially symmetrical, small, in umbrella-shaped clusters; blooms May-June. Acer palmatum fruit. tree-guide.com (Accessed 5/2017). Fruit dry thin, flat, winged seeds (samaras), joined end-to end, arched pairs of winged samaras to 2 cm long, wings incurved, Sept.-Oct. (Dirr 1990). Habitat: Escaped from cultivation into woods. Shade tolerant. Notes: Infected by Botrytis cinerea (Deuteromycotina), and anthracnose appearing as dark, necrotic, spots or scorch-like appearance, caused by Kabatiella apocrypta, Ascomycotina (Dirr 1990; Sinclair et al. 1987; Agrios 1988).